Photo courtesy of Ann Reesman. 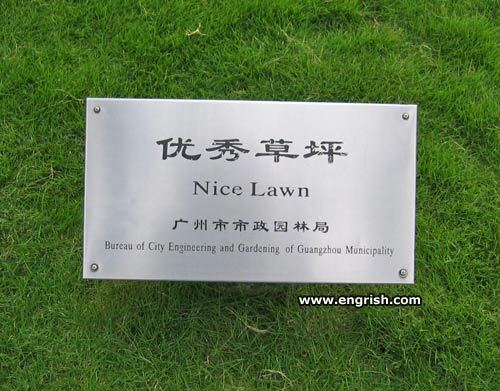 What is a lawn from a city in France doing in China? This nice lawn will not harm you. The Bureau, on the other hand….. Please keep it nice by using our pleasant pathways. @Huu Yuu: It was having a problem with Paris sights. As we know from signs like these: http://www.engrish.com/2005/08/dont-touch-me/ , Chinese grass is so sensitive that it needs a compliment now and then to keep it from dying spontaneously. wouldn’t want anything to ‘appen to it, would we guv’nor? Good. I hate those really mean lawns. @HuuYuu: Guangzhouh is in France???? Huuu Knuuuu??? @Dr. Lex: Hard to believe we’ve found 10 years’ worth of this stuff! The grass is nice, sure, but that Bureau could cause some damage if it fell on you. The lawn is so nice it didn’t even complain when they nailed the sign onto it. Voted 〝Lawn of the Month〞by the bureaucrat of 〝rolling〞 party. Good for making edible carpets. …Shame if something were to happen to it. Hmph. If you seed one lawn, you’ve sod them all. Just don’t lay your lady’s bare bum on me, or I’ll forget to be nice. Brought to you by the Bureau of names unsayable in one breath. The Law which protects these is not so nice. Thanks! The Bureau of Engineering and Gardening of Guamgzhou Municipality gave it to me! You have to be really nice to that carnivorous grass. Nice grass. Nice grass. Until you read its OKCupid profile, at least.